Profiles - View your profiles, view your tower image and stats, backup and restore your profile, move it between machines, and upload to your tower on this website. Addins - Install and uninstall mods and new levels within the game. Options - Configure certain aspects of the game that you can't easily do otherwise - for example changing resolution or removing the loading screen video. Translation - An advanced mode for those interested in translating the game into their own language. Simply run the installer and choose a suitable location. You can uninstall it from your Control Panel. You need Java version 1.6.0 or greater to run this program. The installer should download it for you if you don't have it already, otherwise get it from java.com. You'll need to install the latest version of Java before installing GooTool, otherwise the installation will fail. For more information, see here. You need Java 1.5.0 or greater. 1.6.0 is highly recommended. Try java -version from the command line. See here for more info on installing/upgrading Java. Extract to a directory such as /usr/local/gootool or /home/yourname/gootool, then run bin/gootool. Debian users can simply install the .deb package provided. Simply drag GooTool somewhere (e.g. your Applications folder) and run it. To uninstall, drag it to your Trash. This is the first release with the full source code released simultaneously (#0000244). Available addins are now stored in your home directory and not your custom directory. They will be moved automatically upon upgrade to this version (#0000263). 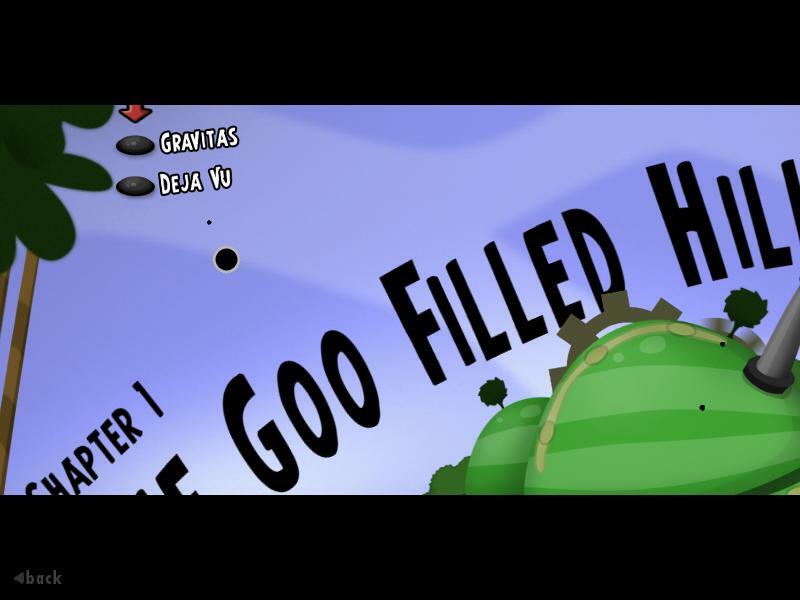 Consume World of Goo's stdout, possible fix for long hangs on "Save and Launch" (#0000261). Added new command-line utility "gooinfo" to dump information about user's profile and tower under Windows and Linux. Run it on its own for syntax (#0000249). Added "gooinfo -validateaddin" to do preliminary addin sanity check (currently just validates the manifest) (#0000250). .bin files are now strictly prohibited in the override directory. Fixed installation of addins with XML special characters (quotation marks etc) in level name/subtitle (#0000266). If a background task fails due to a fatal error (e.g. out of memory), don't assume the task has succeeded (#0000268). Fix profile tower rendering under Mac OS X (#0000265). Fix location of Steam install. Automatically locate World of Goo 32-bit install on 64-bit Windows. Don't throw an exception in addin update check if no addins are installed (#0000271). Abort the build if the target custom directory is the same as the source directory (#0000272). Refuse to install goomods with upper-case characters in their file extension, to avoid cross-platform incompatibility (#0000275). Correctly load the level history from a user's profile, handles levels with names like 4444 (#0000269). Addins with unsatisfied dependencies now show red in the addins tab (#0000178). Decode broken UTF-8 in World of Goo profile names prior to version 1.40 (#0000270). Fix skipeolsequence/cutscene not being respected for levels using addin manifest version 1.1 (#0000252). Fix dependency max-version not being shown correctly on the addin properties dialog. Fixed NullPointerExceptions on startup introduced in 1.0.1 when profile is missing or empty (#0000245). Fix detection of non-Sun JREs under Linux (#0000242). Updated the installer to auto-install a more recent JRE if needed (#0000243). Refresh profiles tab when profile file is changed. Disable publish button if no selected profile. Added an option to the Advanced menu to generate an online ID (for users who are unable to connect in-game) (#0000235). Allow generated online IDs to be removed as and when 2D Boy servers come back online. Display skipped levels in the profile tab. Don't display tower data if the profile has no tower. Don't allow publish if the profile has no online id (#0000236). Addins can now specify a thumbnail image. Add strings easily using text.xml in goomod. An addin can now provide more than one level, so level is now a child of levels. level/ocd is now officially optional. zh, cs, da, eo, fi, ka, he, hu, ja, no, pl, pt, pt_BR, sv, tp, uk, vi (#0000239). Fixed an issue preventing you ever saving again if you uninstall an addin and quit before saving (#0000240). Remember GooTool's window position/size between runs (#0000234). You can now rate addins from the Addins tab within GooTool (#0000175). Added a "Check for Updates" button so you can automatically update your addins (#0000179). 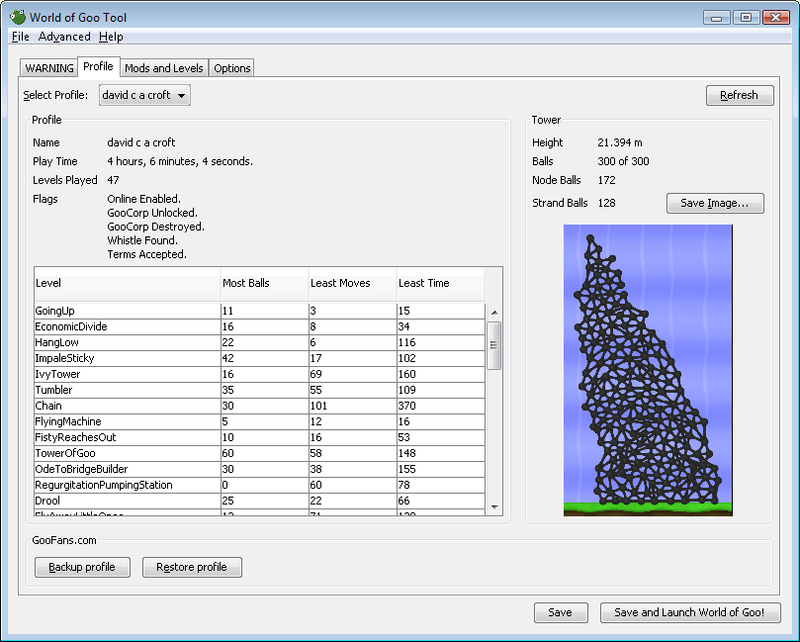 Allow GooTool to find and work with the 1.41 (bin32/bin64) version of World of Goo under Linux (#0000218). Allow GooTool to find and work with the Big Fish version of World of Goo under Mac OS X (#0000225). Added a diagnostic report to the Help menu to aid debugging GooTool problems (#0000232). Use RealIrrKlang.dll if it exists in the source directory, in case user manually installed Maks' volume control (#0000219). Allow changing refresh rate from the Options tab (#0000182). Skip Thumbs.db, .DS_Store and .svn when installing addins (#0000215). Provide scrollbars for long addin descriptions in the addins tab and properties dialog (#0000226). Run lengthy operations in a background thread so the GUI doesn't lock up (#0000174). Rename PC/Linux to Windows/Linux (#0000221). Make AddinInstaller use AddinReader, allowing installation of an addin from an extracted directory. Initial work on iPhone version. Goomod format 1.1: Authors can now specify a thumbnail image for addins. - 0000164: [billboards] First-time build fails due to missing billboards.goomod (davidc) - resolved. - 0000165: [profile] Allow sorting of columns in profile tab (davidc) - resolved. - Use 127.0.0.1 instead of resolving "localhost": prevents it resolving to "::1" on IPv4-only systems giving "Address family not supported by protocol family: bind"
- Adjust layout of Chapter 1 and automatically resize screen to fit installed levels. - Linux startup script now uses /bin/bash due to some strange sh-alikes out there. - Fixed a huge WTF on image encoding on non-Mac platforms. - Added options to the Advanced menu to encode/decode the various game file formats. You can select whole directories or multiple files. 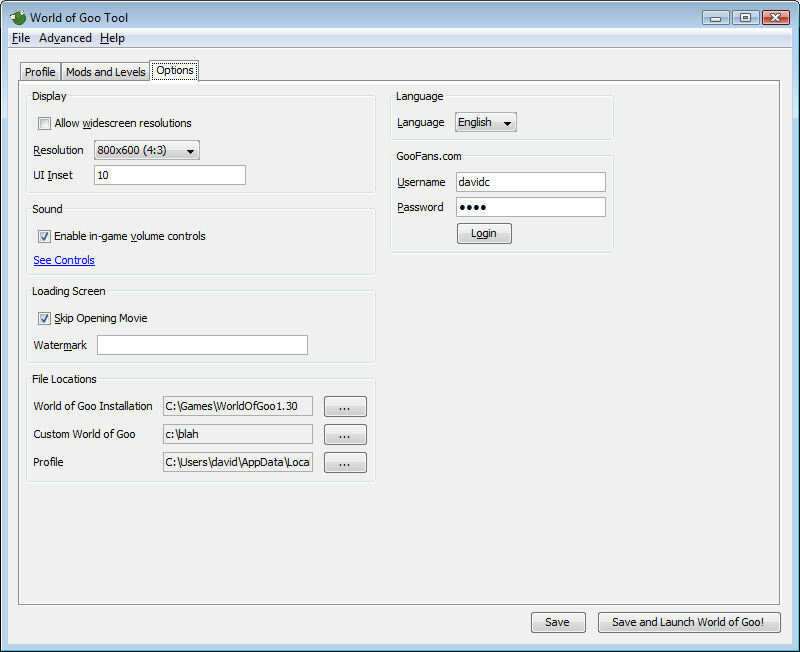 - Preliminary support for the World of Goo Linux beta added. If you want to force GooTool to use your WINE World of Goo, run "GOOTOOL_PLATFORM=windows bin/gootool"
- Moved Addin description to the main Addins tab. 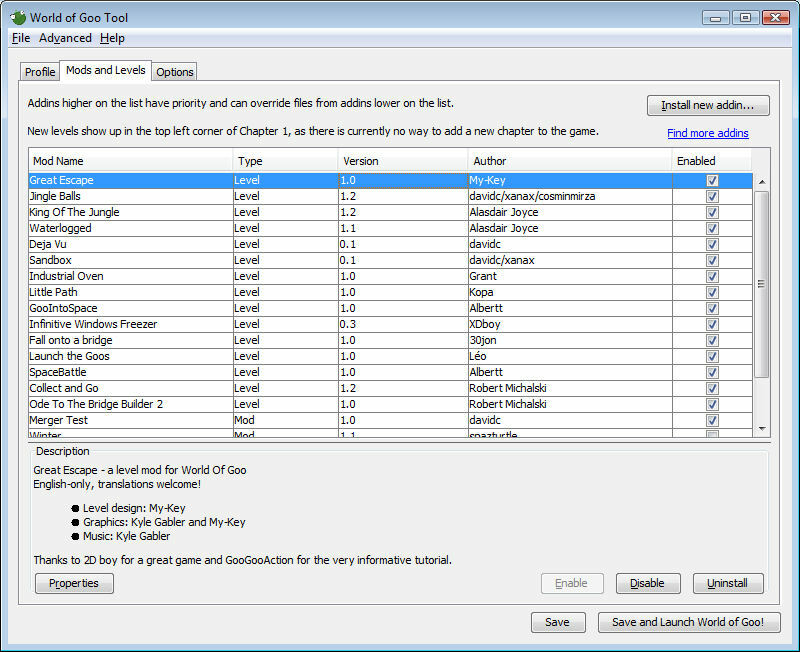 - When installing a level addin, notify them again that the level appears on chapter 1. - Enabling addins. You can now enable addins and build your World of Goo! - You can now install level-type addins. They are now fully merged and appear as new levels at the top left of Chapter 1. - Better file/directory support. GooTool will now remember where it last found WorldOfGoo.exe, and it lets you manually locate your profile if it can't find it. 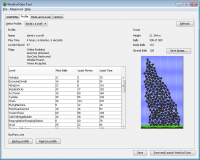 - You can now choose the custom directory where GooTool will build your World. This enables Vista users with UAC restrictions to still build. - Progress bar added for long operations such as initial load and file merging. - Loading screen watermark now works. - Addins can be reordered properly. - Taller towers are no longer cropped in the profile pane. - Loading current preferences (language, resolution, ui_inset). - Generating various images of the tower. - Installing mod-type addins to the addin directory (but you can't enable them yet). - Uninstalling mod-type addins from the addin directory. - Automatic detection of JRE. - Decrypting and encrypting .bin files. - Decrypting and parsing profile data. - Transformation/merging of XML files. There are 5 current downloads. Show 46 archived downloads. This software, including all programs, computer files, and associated documentation, are Copyright (c) 2008, 2009, 2010 David C A Croft. All rights reserved. 4. 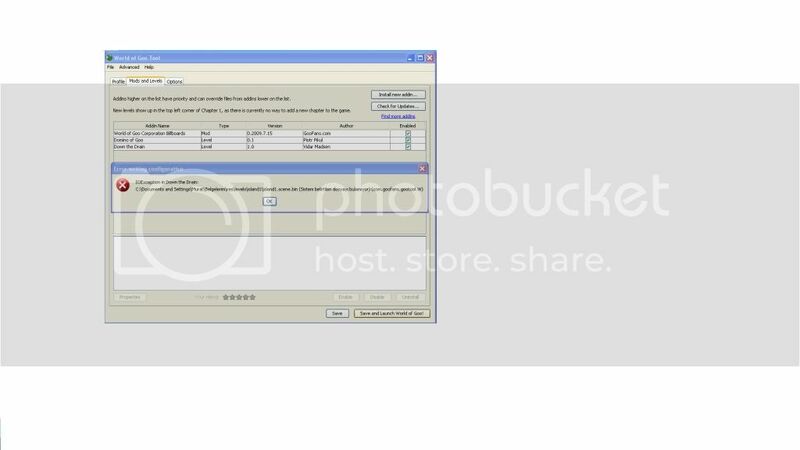 You may not use the name "GooTool" in any modified version. For the avoidance of doubt, only original files downloaded from http://goofans.com/ may keep the name "GooTool". Under Windows, this program uses launch4j. Copyright (c) 2004, 2008 Grzegorz Kowal. See LICENSE.launch4j.txt for the license. This program uses user interface classes Copyright 2000-2005 JetBrains s.r.o. See LICENSE.jetbrains.txt for the license. This program uses cryptographic functions from the BouncyCastle library. Copyright (c) 2000 - 2008 The Legion Of The Bouncy Castle (http://www.bouncycastle.org). See LICENSE.bouncycastle.txt for the license. This program uses JSch. Copyright (c) 2002,2003,2004,2005,2006,2007,2008,2009 Atsuhiko Yamanaka, JCraft,Inc. See LICENSE.jsch.txt for the license. i cant even use the website uploader because it says i havent enabled online play please help!!!!! GooTool is really buggy on Windows 7. Maybe you should try to make a separate version specifically for Windows 7 because compatibility mode itself won't work! You need the Windows 7 ISO but you can download that either as a torrent or sending me files to evaluate because I installed it a week after it came out. ottomobille: Get a copy of GooTool 1.0.1 and use the new option on the Advanced menu: "Online Player ID->Create". This problem is caused by 2D Boy's World of Goo Corporation servers being down, so the game doesn't automatically generate an ID. Enchanter49: I will put this on the TODO list. I've tried to reinstall the software, but it doesn't resolve the problem. 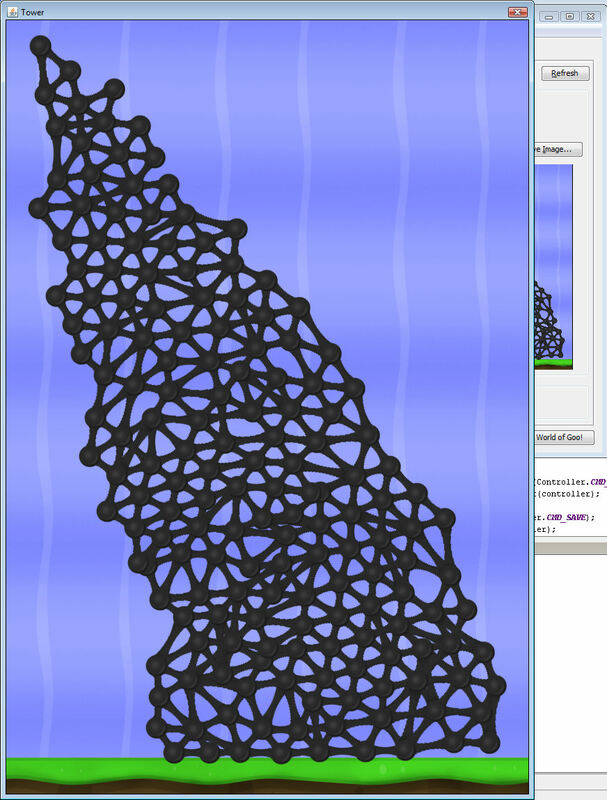 Fortunately World of Goo still works normally. If someone has an idea to fix this.... Thanks in advance! SirFratus: please check out http://goofans.com/gootool/troubleshooting/crash and create a new forum topic with the relevant part of your logfile. 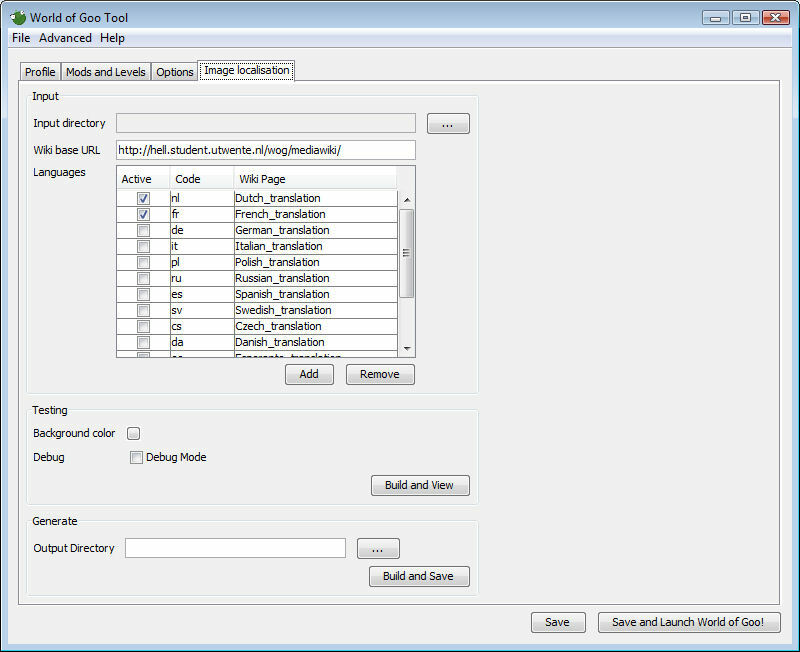 Can you transfore your previous gootool files to the new goo tool? The goo must be flamed. Of course. Just download and double click and gootool will be updated. Since I've upgraded to ubuntu 9.10, the soft starts again. I've no explanation, sorry for the inconvenience. It's enjoyable and helpful, but I still have some problems and Errors. Okay, I'm an idiot. Just found it! Okay I found the problem for Windows 7 and how to fix it. This is for reference for all Windows 7 users having trouble starting gootool! Right-click on the gootool icon shortcut and select properties. When it pops up, go to the compatibility tab and check the box labeled 'Run as Administrator' and press okay. It should now work perfectly. Except it might show a 'blank' loading window, but it still works fine. In other words, run it with administrator priveleges. I got World of Goo on Steam, will GooTool and other stuff on this website still work with it? found the answer in FAQ after I asked as well lol. modes where we will put? Eh, that does look like a problem. Could you post a higher-resolution image so that we can see what the error is, or could you just write out what it says? Okay, that's better. I just couldn't read the text before, it was too small. Other than this, I dunno. Anyone else have any thoughts? In adding level names and other texts (using addin.xml and text.xml files) is a problem with non-english letters. Why they don't works, when with Encrypt function and in merge folder's files everything's OK? GooTool/goomod handles non-ASCII characters fine, BUT you need to make sure you're editing text.xml/addin.xml with a Unicode-aware text editor. If using Windows, I believe Notepad fails but Wordpad works (might be the other way around though). And UTF-8 coding works correctly. And I have one thing about Goo Tool and mods adding. can gootool works in demo? No, you need the fully-patched retail version. So I want to be able to control the volume, so I got the gootool. I have the full version of the game, but when I start up gootool is says I have the demo version and need to upgrade to use the tool. I have gone through all of my files and have 'uninstalled' the demo. Then when I tried to use the gootool...another problem occurred. I tried to enable the sound control by clicking 'enable in-game sound control' and then hit 'save' but it wouldn't save. An error message popped up saying that it could not re-write the file. Is there something I can do about that? eehsiuqs, please see this page to locate your logfile, then create a new topic with this info in the bug report forum. I fixed all of the problems. Took about an hour of fiddling with my computer, but got all of the controls to work and all of the bugs taken care of. Thanks though. I install it. I had the game World of Goo with a profile. well, I install gootool and it can't find the profile on the world of goo game. He creats a new install past for what?? I already uninstall both programs and the really profile seems to be ALWAYS in my pc. I really want to share my towers but with this .... it's impossible! If you are having problems with GooTool you should create a new forum topic. It hard for me to understand you, you are having problems with uploading your peofile to goofans? There is a problem when I change the game's resolution, the continue flush tingy at the end of levels is misplaced! That probably means that you don't have your game patched to v1.3. Mh, is it just moved a little, or seriously out of place (e.g. really ugly or even unclickable)? Small changes are normal when the resolution is changed. Especially normal <=> widescreen. Oops sorry! the problem only occurred before I used the patch. the goo tool doesn't allow me to publish my profile. and I can't upload it, also. How do I compile the source code into an installer file so that I can test the program? javerikr: You need JDK, ANT, and ideally (but optionally) IDEA. Run the ANT build file with the 'dist-win32' target and the installer will end up in the 'dist' directory. James: This happens if the mod author puts a different version number in the goomod file than in they specify on the site. They actually have to manually change it on the upload form (it defaults correctly) so it's pretty hard to do... file a report on the individual addin pages! This is weird . I downloaded GooTool and it works great! The add-ins and levels work. I have finished the game but when I go to the profiles tab I only have 3 levels there... Going Up, Economic Divide and Hanglow. The saved profile is in the 2DBoy folder. It says for going up 10 most balls which was my old record but I currently had 11 balls. Also when I build my tower in WOGC it also doesn't show. HELP! Did you have the trial version of World of goo before you got full version? That usually causes the problem.